Winter is on it’s way out the door here, and good riddance! We’ve had quite enough snow and cold, thank you very much. 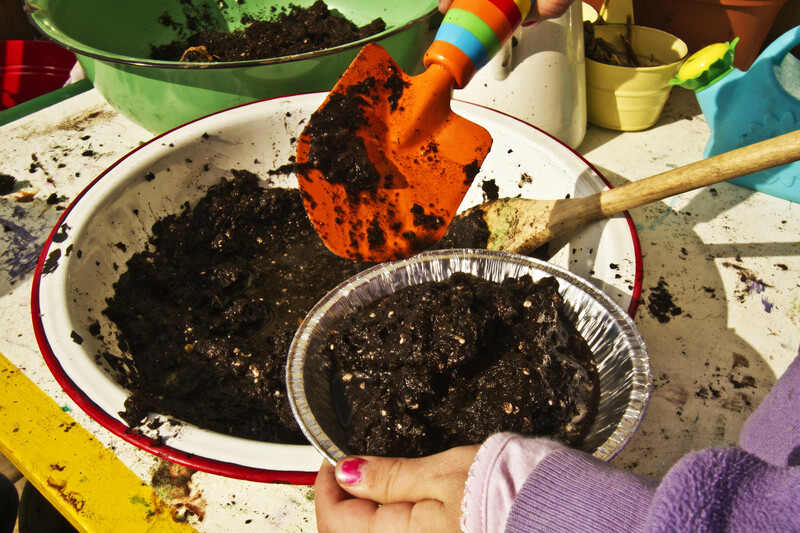 It’s time to pull out the wellies and raincoats and get down to the business of getting dirty! We already have a sandbox outside, but it’s just that. A sandbox. It serves it’s purpose all the day long, don’t get me wrong. But we needed more. A little something to celebrate the coming of Spring. 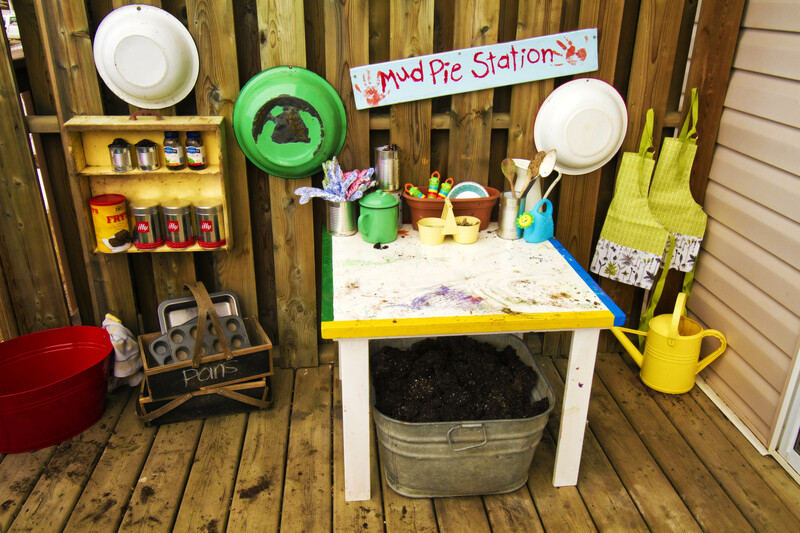 And so, we transformed one little corner of our patio into a true-blue mudpie-making station. It didn’t cost one tiny little cent. And it shouldn’t cost you anything either…unless you need to buy the dirt. 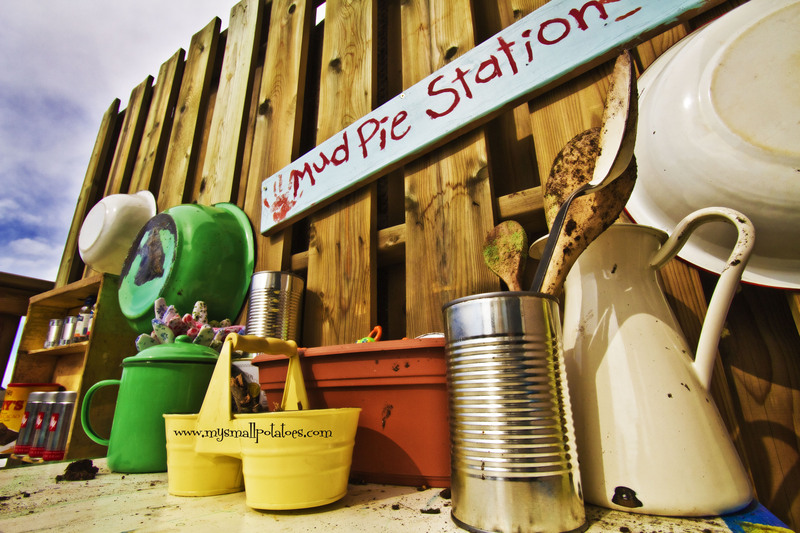 Every mudpie station needs dirt. You can use sand, if you like. I emptied a few terra cotta pots filled with potting soil I had grown herbs in last summer, into a big metal tub that I have had for years. I placed it right under the table so the kids could easily scoop and dump in and out of their bowls without having to haul it across the patio. This also helped to contain the muddy mess to one area. 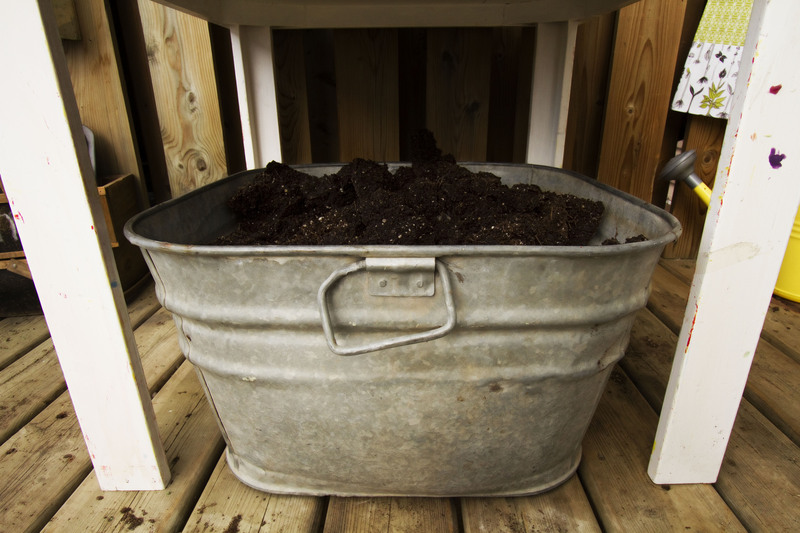 If you don’t have a big ol’ tub like this one, a plastic storage bin would work just as well. The table I used was one that we outgrew in the day home, as our numbers were rising. I had stored it out in the garage, because I have a bad habit of never throwing things out. It was in rough shape, with paint and scuffs on it, but that is the perfect kind of tables for mudpies. Perfect tables make mums worry about them getting dirty, scratched, or weathered. I decided our station needed a sign, so I grabbed an old board, my 7 yr old daughter painted it, I wrote the words on it, and my 5yr old son lent me his painty hands! It was done in less than 20 minutes! 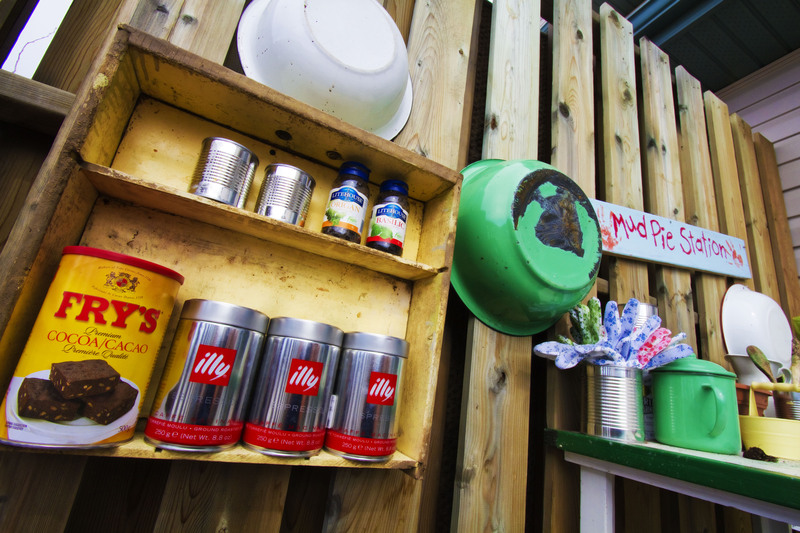 Next I drilled some wood screws into the fence boards and hung my old enamel-painted tin bowls up. I have collected a few over the years from garage sales and little shops. 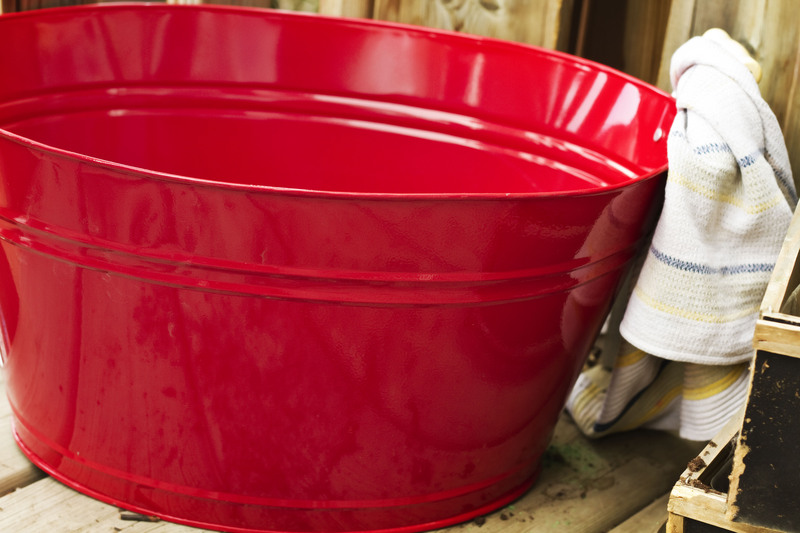 If you don’t have any of these, don’t worry…plastic buckets will do just as well. Just use extra long screws or hooks, and hang them from their handles. Make sure you hang them at heights that the children can reach without assistance. I used an old wooden drawer to make an excellent spice rack! I just screwed it right to the fence and filled it with old spice jars, coffee tins, and such. See? Very simple.And very effective. 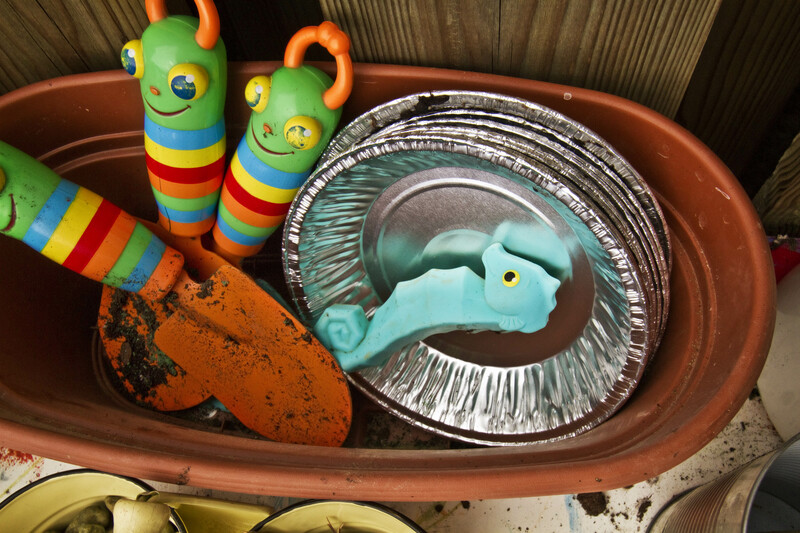 Now you can start filling every little tin or empty can you can find with odds and ends for mixing and decorating their mudpies. We used twigs, pinecones, pebbles, and coloured sand. 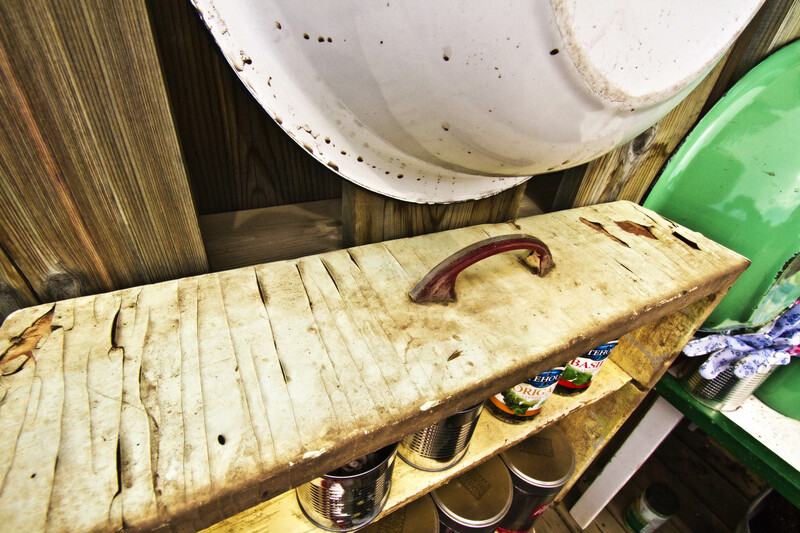 Don’t forget to include wooden or metal spoons for stirring, and a jug for pouring water.You can’t have mud without water! Also, make sure you have a storage place for muffin tins, cake pans, and pie plates. I had a few ratty ones that were in my cupboard. They were a bit rusted and in need of replacing, so I put them outside in box for the kids to use. I also hung plastic aprons on screws, and stuffed a bunch of garden gloves in a can, for those kids who are a bit fussier about getting dirty. I also supplied the children with shovels for digging dirt out of the metal tub, and foil pie plates, as I did not want to sacrifice any of my kitchen ones. Now that we’ve got all the basics covered, the rest is just fun!! Get playing! But don’t forget to add a wash bin! You will be happy you did! I just used my ice tub and hung a towel on the handle. I fill it with warm water before every “baking session.” Simple. So there you have it! A fun, inexpensive project to usher in the spring season. I hope this brings you and the children in your life, plenty of hours spent playing in the dirt! Awesome! Looks like alot fun, I want to come to your “mudpie station”! That looks fantastic!! Well done 🙂 You have inspired me to make one for our girls! Lovely! You have thought of everything. I can’t wait until my daughter is a bit older to create our own Mudpie Kitchen. Thanks for the inspiration! What a fab idea! I’m sure my kids will LOVE one of these! super duper fun! i wish i could do this at my school!